ITW Dynatec Service & Support - Global Coverage, Local Responsiveness. At ITW Dynatec we maintain a strong emphasis on providing unparalleled service and support for our customers. From our preventive maintenance programs that save you money, to our 24/7 customer support network, it’s easy to see why so many have trusted their hot melt services to ITW Dynatec for over 45 years. Toll-free access to our experienced Technical Support and Customer Service teams are available at no charge on business days from 8 am to 5 pm (CT). Our Technical Support team can assist you with troubleshooting and equipment inquiries at 615.824-3634 with a 24/7 after-hours emergency response system. Our Customer Service staff is here to answer questions regarding orders, parts, pricing and availability at 615.824.3634. 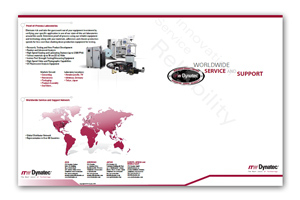 For a more detailed description of ITW Dynatec's service and support capabilities, please download our Service and Support Brochure.